(Nanowerk News) Field-effect transistors (FETs) made of organic single crystals show superior mobility values as organic single crystals have fewer structural defects than their amorphous and polycrystalline counterparts. However, single-crystal devices are practically difficult to fabricate. For both fundamental studies and technological applications, high-throughput fabrication of single-crystal FETs is highly desired for either examination of device performance statistics or realization of a large array of devices and has attracted the attention of researchers from both academia and industry. 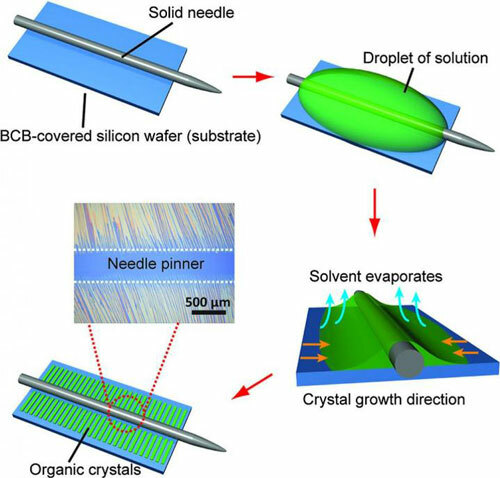 In an article published in Science Bulletin ("Large-scale fabrication of field-effect transistors based on solution-grown organic single crystals"), Prof. Hanying Li's research group describe a simple solution processing method where well-aligned single-crystals of organic semiconductors throughout a 1cm × 2cm substrate can be grown from a droplet pinned by a metal needle. The well-controlled alignment of the crystals originates from the unidirectional receding of the pinned droplet regulated by the capillary force. Because of the crystal alignment in a large area, fabrication of device arrays become possible. More importantly, this simple method is applicable to a wide range of organic semiconductors and potentially to inorganic materials, with six examples including both p- and n-channel materials demonstrated in this work. Furthermore, large-scale FET arrays are fabricated and studied, using TIPS-pentacene crystals (a well-known p-channel material) as an example. Among the 330 devices randomly selected from 2 substrates, an average hole mobility (µ) of 3.44 ± 1.21 cm2V-1s-1 with the maximum value of 6.46 cm2V-1s-1, on-to-off current ratios (Ion/Ioff) > 105, and threshold voltages (VT) between -20 to -58 V were achieved. Among the 330 devices, 328 FETs showed the mobility above 1 cm2V-1s-1, the other two were 0.94cm2V-1s-1 and 0.92 cm2V-1s-1 respectively. The achieved FET performance is among the best reported ones. As such, this work provides a highly efficient, yet simple approach to evaluate the charge transport properties of organic semiconductors through examining the performance statistics of single-crystal devices.